Mount Airy, N.C. - Twice on the old Andy Griffith TV series, Sheriff Andy Taylor and Deputy Barney Fife talked about going to the Snappy Lunch diner. They never got there, at least on camera. "The Andy Griffith Show," which premiered 30 years ago Oct. 3, taped its final episode in 1968, but down on Main Street at the real Snappy Lunch, they're still waiting for Andy - Griffith or Taylor. Each day, proprietor Charles Dowell says, tourists wander in to his 1923-vintage diner from as far away as England. They want to somehow touch a bit of Mayberry, the show's fictional setting based loosely on Mr. Griffith's memories of growing up in this town near the Virginia border. Since Mr. Dowell's establishment is the last surviving business mentioned by name on the program, the sad task of breaking the news falls to him. Just the other day, a Midwestern couple asked whether, perhaps, Mayberry wasn't just a little farther down the road. "I told them unfortunately not," Mr. Dowell says solemnly. "They seemed disappointed." As Faulkner aficionados prowl Oxford, Miss., for Confederate statues and other temporal landmarks of an imaginary landscape, so Mayberry zealots make the pilgrimage to Mount Airy - a sort of sunnier Yoknapatawpha - in search of the haunts of Andy, Barney and Aunt Bee. But a lot more people have seen "Andy Griffith," which ended its final season as TV's most-watched program, than have read "The Sound and the Fury." Two decades after the series wrapped, "Andy Griffith" reruns play in more than 100 U.S. television markets. A critic at Entertainment Weekly magazine recently judged it America's all-time best TV show. "People are craving a town that doesn't exist," says Mr. Dowell, 62, a soft-spoken man with a basset hound visage. "Wouldn't you love it to exist? People knew everybody, no hustle and bustle. You can't dream up anything better than Mayberry." Indeed, Mayberry broods over Mount Airy like a shadow geography. The same image of Mr. Griffith - a publicity photo blown up to various sizes - stares down from office walls and corridors all over town like some Albanian dictator. Mount Airy's self-image and sense of past are so entangled with its fictional counterpart that it's sometimes difficult to tell where one ends and the other begins. When "Andy Griffith" premiered in 1960, it was already steeped in nostalgia, a safe refuge from the decade's political and social tumult. Mount Airy, for instance, already had a population of 7,000 and a municipal police department, compared with Mayberry's 2,000 and its two-man county sheriff's office. Today, much of Mount Airy suggests Anywhere, North America. 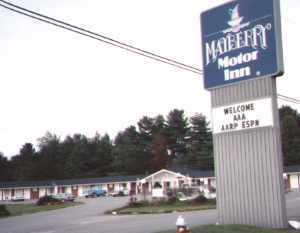 There are divided highways, franchise restaurants and strip shopping centers (one of which is called Mayberry Mall). But the heart of Mount Airy does bear a certain resemblance to its video offspring. Main Street is lined with handsomely restored turn-of-the-century granite and brick storefronts. Handsome bungalows, with unscreened porches, stand along maple-shaded residential streets, further evoking prewar small-town America. 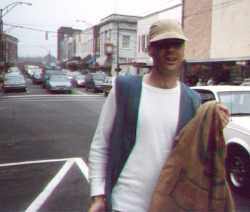 Mr. Griffith left town after high school to attend the University of North Carolina at Chapel Hill. Although he maintains a residence in Manteo, N.C., on the Outer Banks, he rarely visits Mount Airy, to the frustration of locals. In another sense, however, Mr. Griffith never really left, so resonant are the links between his TV show and his hometown. He owned the program and thus exercised a veto over the writers. Many of them visited Mount Airy to get a feel for Mayberry. For natives watching the sitcom, particular turns of phrase ("Pipe down!" "You beat everything, you know that!") and folk-life staples (pie-eating contests, bluegrass music, lazy Sunday afternoons on the front porch) stir redolent Mount Airy memories. Longtime residents know that after the show premiered, Surry County elected its own flesh-and-blood "Sheriff Taylor" - Sheriff Jim Taylor, who served from 1966 to 1974. They also know that a fellow nicknamed Hop Along Cassidy was the model for Mayberry town drunk Otis Campbell. And that a late aunt of Mr. Griffith's, Grace Moore, probably inspired Sheriff Taylor's Aunt Bee. "She was fat just like Aunt Bee and cooked all the time just like Aunt Bee," says her son Evan Moore, who takes pride in his cousin's celebrity. Told that he has jug-handle ears like Mr. Griffith's, he says, "Thank you." A retired cabinetmaker of 78, he notes that a Welsh cupboard he built was the model for one installed in Aunt Bee's kitchen on the set in California. Even Mount Airy residents unrelated to Mr. Griffith take the show personally. Some were offended when the estate of Frances Bavier, the late actress who played Aunt Bee, was auctioned in June. A New Yorker with no family ties to North Carolina, she had retired to Siler City, a town sometimes mentioned on the show as a travel destination of Aunt Bee's. The auction, says local arts administrator Tanya Jackson, "was like you'd dumped the contents of our kitchen drawers on the floor and had a bunch of strangers sifting through them." But no one seems to take the show more personally than Mr. Dowell, who figures he must have served young Andy at the Snappy Lunch years ago. In recent years, Mr. Dowell began noticing a growing number of out- of-towners visiting his cozy, unaffected eatery, where the most expensive item ($1.50) is the house specialty, a pork-chop sandwich. So he began festooning the walls with stills and cast photos from the show. Now the Snappy Lunch serves as a sort of secular shrine to Mayberry and Mr. Griffith. "He's the biggest idol I've ever had," Mr. Dowell says, gazing at a photo of the actor. "If I had the choice of talking to anybody on the face of the earth, it would be Andy Griffith." Mr. Dowell thinks this could be the year it happens. He says he's had the same dream twice in three weeks: He's at his parents' house. So is Andy. But every time he starts to say something, someone interrupts. "It's so real," he says. "I just almost get to him, and I don't. And I want so bad just to say four or five words to him." Next door to the Snappy Lunch at the City Barber Shop, Russell Hiatt, arms raised with comb and scissors in hand, is easing into his next haircut. "I'm gonna get a ponytail," 6-year-old Alex Davis announces. "No you're not," his mother snaps, watching sternly. "A rattail is what you mean," Mr. Hiatt says, a twinkle in his blue eyes, as he turns the chair for a better angle. Mr. Hiatt, whose business is decorated with snapshots of customers and stills from the show, claims City Barber Shop was the model for Floyd's in Mayberry. Never mind that the Palace Barber Shop around the corner could make an equally strong claim. No one would suggest that City Barber Shop, with its bottles of Jerris Hair Tonic and Beau Kreml along the marble shelf, doesn't at least feel like Floyd's. And if anyone misses the point, Mr. Hiatt sells T-shirts emblazoned "Floyd's . . . 2- Chairs No Waiting, Mayberry, N.C."
A white-haired string bean of a man, the 66-year-old Mr. Hiatt has been cutting hair at City Barber Shop for 44 years. He says he gets hundreds of tourists each year. Some get haircuts. Most just want to buy a T-shirt, look around and have their picture taken in one of his circa-1920 barber chairs. 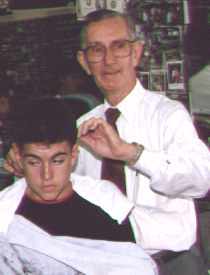 By now, Mr. Hiatt's young customer is well into the flattop he's had to settle for. Planing the boy's head into a Kansas flatness, Mr. Hiatt reminisces about Mayberry. Tourists generally ask the same questions, he says. "A lot of them will ask, `What kind of guy was Floyd?' "
"I tell 'em I didn't know Floyd. He died a few years ago." "You mean Howard McNear, the actor who played Floyd, died?" "Yeah," says Mr. Hiatt, pausing, as if to catch himself. "Yeah . . . the actor." Although thousands drawn by the Griffith series visit Mount Airy every year, the town's investment in Mayberry tourism is limited. In addition to the City Barber Shop and the Snappy Lunch, there's the Andy Griffith Playhouse, a local venue for the performing arts, and the Mayberry Motor Inn - until two years ago the Mount Airy Motor Inn. The owner plans to open an Aunt Bee parlor soon, a guest room furnished with a bedroom set purchased at the Bavier estate auction. In all, only eight businesses in the city directory trade on connections to the show, a list that begins with the Mayberry Alarm & Lock Co. and ends with Mayberry R.F.D. Inc., a developer. Among Mount Airy business leaders, such meager attention to what they view as a potential windfall in Mayberry tourism is like watching a river of gold flow out to sea. After all, from a booster's point of view, "Andy Griffith" is nothing less than a non-stop Mount Airy promotional video - a perpetual 30-minute sales pitch running hundreds of times a day, selling America at large on the idyllic joys of this small North Carolina town. And just how many small towns, Mayor Maynard Beamer asks, can match that kind of exposure? 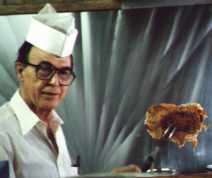 Over a pork-chop sandwich at the Snappy Lunch, Mr. Beamer is detailing his version of Mayberry's future. "Some of us would like to set up a place and call it Mayberry, maybe between here and the interstate," says the mayor, a bald, round-faced man of 71 who enjoys his oft-noted resemblance to Otis, the Mayberry drunk. The proposed attraction, which has the backing of most local leadership, would recreate a physical chunk of the fictional town: a few storefront offices, certainly Sheriff Taylor's and Floyd's Barber Shop. There would also be an auditorium, where episodes of the program would be screened. "You could watch the old show, then maybe you could go next door and get Floyd to trim your hair," Mr. Beamer says. "I believe it would be a drawing card." Like other residents, the mayor sees no irony in Mount Airy building a theme park reproduction of a Hollywood set that was based on the town in the first place. Yes, he says, Mount Airy inspired the show, but it can't offer visitors a tour of Andy Taylor's office. Nor does he fret about Mount Airy becoming a caricature of itself. "The Liberty Bell," he says, "doesn't make Philadelphia tacky."